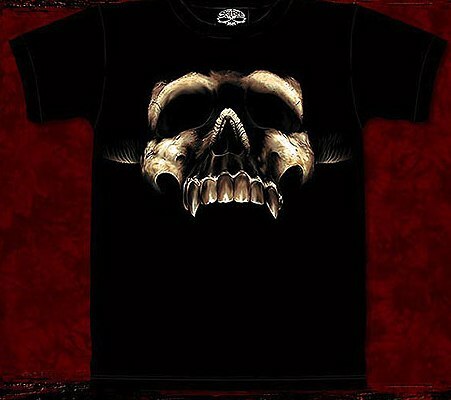 Put the bite on someone with our Vampire Skull T Shirt. Available in Medium, Large, X Large, 2 XL and 3 XL. Please use the drop down menu below to select your size. Please note that the T shirt color may vary as the shirt is hand dyed. It does not affect the silkscreen and tends to make the silkscreen stand out more. Variations in dye color on the shirt is a part of the shirt design.